can be Integrated Into any fully enclosed coat we manufacture. Every year workers become sick from heat exposure on the job. Some of these incidents are fatal. Operations involving high air temperatures, radiant heat sources, high humidity, contact with hot objects, and strenuous physical activities have a high potential for causing heat related illness. Workplaces with these conditions include iron and steel foundries, nonferrous foundries, brick firing and ceramic plants, glass product facilities and many others. When air temperatures are warmer than normal body temperature, blood circulated to the skin cannot lose its heat. The body begins to sweat to cool off. If the humidity level in the air does not allow evaporation, then sweating is not effective. When the body cannot get rid of excess heat, it stores it. When this happens, a person begins to lose concentration and has difficulty focusing on a task. Sickness, fainting, and even death can follow if the person is not cooled down. These illnesses and deaths are preventable. Silver Needle Inc.™ now offers a way for workers to combat heat related illness and injury with our Heat Stress Cooling System. 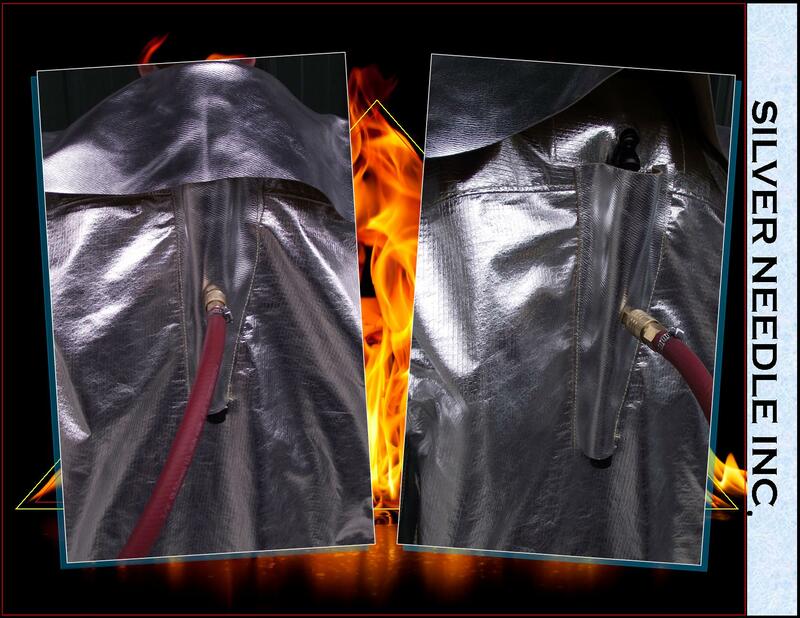 We have integrated a Vortex Cooler into our aluminized coats which takes compressed air, cools it drastically (up to 2800 BTU/H refrigeration) and delivers the cool air into the coat keeping the wearer comfortable. The unit can be adjusted to deliver cooler air or more air flow inside the coat. Flexible air lines inside the coat direct air to the front of the body and down the back, but can be configured so that all air is delivered to the front where a furnace worker takes the most heat. No special maintenance on the system is required. The vortex tube connects to any standard 1/4 inch quick connect fitting attached to an incoming air supply line from a compressed air source in the work area. We recommend 100 psi inlet pressure and delivery of 35 cfm input flow into the unit, however this much pressure and volume is not necessary for the system to create refrigerated air. We supply a 3 foot air hose with each system to connect directly to the coat so that the wearer can reach behind them and connect or disconnect themselves from the incoming air without assistance from another person. The system is not bulky and does not reduce mobility for the wearer. The vortex unit can be removed from the coat when the coat is no longer serviceable, and a new coat can be purchased to put it in. If heat stress is a problem for your workers, please call us for more information about how our Vortex Cooled Clothing can be implemented at your facility. Please remember Silver Needle Inc.™ can design your coat to suit your specific industry needs. Call and let us know how we can help you reduce heat related stress, illness, and injury at your workplace.